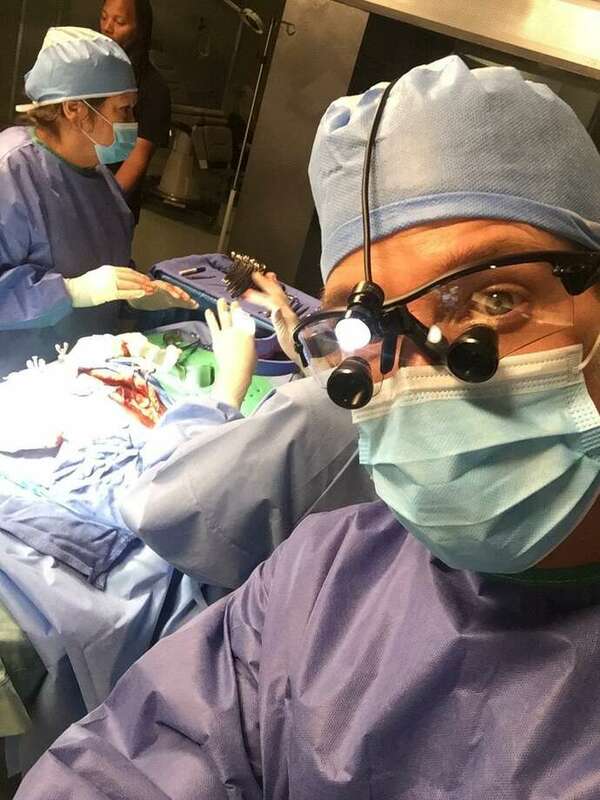 Ward Horton of Fairfield operates as Dr. Scott Strauss on new CBS medical drama "Pure Genius." The show premieres Oct. 27, 2016 at 10 p.m.
FAIRFIELD — Town resident Ward Horton recently landed a role that requires a lab coat and a cross-country commute. Even with the Los Angeles gig in the new prime-time medical drama “Pure Genius,” he and his family plan to stay in Fairfield, a town they love. Horton plays Dr. Scott Strauss on the show, his first starring role on television. The CBS show follows a wealthy Silicon Valley tech genius and the team of top doctors and tech experts he assembles at a hospital he built to treat patients with challenging medical cases at no charge. Strauss, a doctor with a background in internal medicine and psychology, is part of the tech-forward Bunker Hill Hospital team. Horton and the cast shadowed doctors at Cedars-Sinai Medical Center in L.A. and learned from Dr. Brennan Spiegel, director of the hospital’s Center for Outcomes Research and Education, a team created to investigate the use of digital health technologies. Among other medical professionals on set, the scrub-clad surgical assistants seen during operations on the show are actual nurses who guide Horton and his co-stars to make sure they play their parts as spot-on as they can. Horton’s character appears in group scenes in the first episode, but has a reveal a couple episodes in, shedding light on a four-year period during which no one knows what Strauss was doing. There is a mystery to the character, and the reveal takes the character development in another direction, Horton said. “Scott Strauss — because of who he is and his experiences — he sees things in a different way than some of the other doctors do in the hospital, and that’s going to be fun to play with going forward,” he said. The “Pure Genius” script caught Horton’s attention when he saw “Friday Night Lights” and “Parenthood” writer Jason Katims was behind it. He sent an audition tape and the casting came together. “Pure Genius” is Katims’ first procedural, Horton said, so while that format can allow viewers to come in at any time and watch an episode without background, the show has strong, deep characters typical of Katims’ work. The writer has added “gut-wrenching emotional content” to the characters which, along with the tech angle, separate “Pure Genius” from other medical dramas, Horton said. Horton was born in Morristown, N.J., and moved to Hillsborough, N.C., where his parents had a farm, when he was 8 years old. After graduating from Wake Forest University, he returned to North Carolina to work in asset management until 2001. After 9/11, Horton said, he realized he was not following his passion. Around that time, he married his wife, Alexa, and decided to make a major life change. The couple moved to New York City, where Horton worked in finance and in theater for a year before transitioning to work solely as an actor. Working as a New York-based actor, Horton has guest-starred on numerous TV shows, played parts in movies including “Alto” and “The Wolf of Wall Street,” among others, and had roles in off-Broadway and regional theater performances. But the actor’s breakout role came as the male lead in the 2014 horror film “Annabelle,” a spin-off of “The Conjuring,” his “coming out moment” as an actor. “It’s been a long road, but I’ve really enjoyed the ride,” he said. About nine years ago, when his daughter was 2 years old, Horton and his wife realized they wanted to move out of the city and worked their way up the coast, knowing they wanted to live on the water. After spending a summer in Westport to get to know the area, the couple picked Fairfield “kind of on a whim,” liking the town and its commutable distance from New York. He said his family loves the great restaurants and family activities in Fairfield and, as an outdoorsy type, Horton enjoys salt-water fly-fishing in Long Island Sound during his time off, as well as golfing and playing basketball. Horton’s daughter Grace, now 10, plays piano at the Fairfield School of Music, and his 7-year-old son, Will, plays lacrosse at Wakeman Boys & Girls Club. While Horton is now working in L.A. to film “Pure Genius,” he and his family have chosen not to move and plan to stay even if the show runs for multiple seasons. One of the best parts of working on the show for Horton personally has been that the show is accommodating his East Coast-West Coast commute, along with a close cast. He heads home to Fairfield every other weekend, unless his family flies out to L.A. for a visit. Even with the commute, Horton said he will miss experiencing the changing seasons and colorful leaves of an East Coast autumn. “Pure Genius” premiers Thursday at 10 p.m. on CBS.